Ann Pibal is a painter whose works were recently exhibited at Meulensteen in New York and the DeCordova Biennial and are held in the permanent collection of the Brooklyn Museum of Art. Rebecca Wolff is the author of three volumes of poetry (Manderley, Figment, and The King) and a novel called The Beginners (Riverhead Books, 2011). She is the editor of Fence and Fence Books, the publisher of the Constant Critic, and a fellow at the New York State Writers Institute at the University at Albany. A native of Chelsea, NY, she now lives in Hudson, NY. 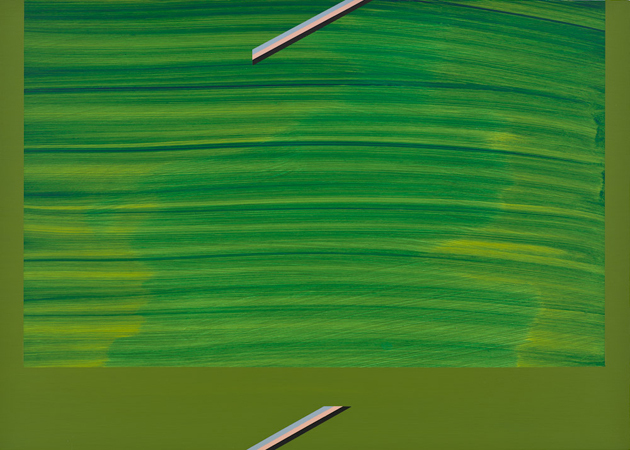 March 24, 2012 7 p.m.
Ann Pibal, GNLS, 2011, acrylic on aluminum panel. In his Ars Poetica, Horace famously analogizes the painting and the poem, “ut pictura poesis,” “as is painting, so is poetry.” In the spirit of this long-standing comparison, Triple Canopy has invited painter Ann Pibal to speak about the poems of poet, novelist, and publisher Rebecca Wolff, who will in turn speak about Pibal’s paintings. Please join us for an evening of readings and conversation on and along lyric and chromatic lines. Moderated by Triple Canopy senior editor Lucy Ives.